Confirmation, like Baptism, is a sacrament of initiation carried out through anointing, the laying on of hands, and prayer. Through the sacrament of Confirmation the faithful are more perfectly bound to the Church and are strengthened through the Holy Spirit. According to Catholic doctrine, the sacrament of Confirmation is seen as the sealing of the covenant created in Holy Baptism and strengthened in their Christian life. God our Father has marked you with his sign; Christ the Lord has confirmed you and has placed his pledge, the Spirit, in your heart. Confirmation preparation takes place roughly every two years in St Mary’s, the last preparation ending with Confirmation last October when 20 young people were confirmed by Bishop Peter. The next preparation course will begin in January 2020.Candidates will normally be age 12 and above. 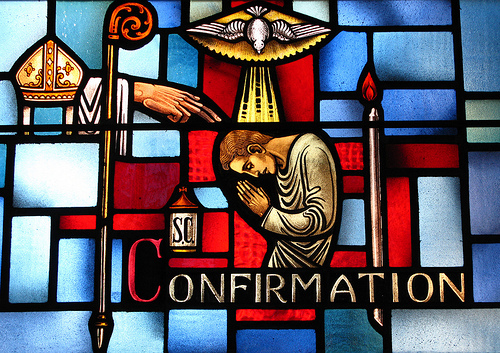 If you wish your child to celebrate the Sacrament of Confirmation please let Fr Charles know and we will, with your permission, retain details and notify you when the next course begins. The forthcoming Confirmation Preparation Course commences in January next year, 2020. For further information please contact Fr Charles on (01745) 353395.